The 2006-07 season proved to be one of 3 in which we harvested truffles in this orchard. I grow ever more grateful for the orchard we planted in 2004. Every year I am a little more optimistic about its future harvesting potential. When we find that first basketful of truffles there, that will be a very happy day! I think it will be every bit as great as when we found the very first ones! The first year our harvest was around 5 lbs. The next year, we suffered such a severe drought that we really couldn’t water enough. We watered so much that the pond level was low enough that we worried about the amount of sediment the pump and filter could accommodate. Thank goodness we had that pond. Our well could never have provided enough water. So, the harvest was a little smaller that next winter, around 4 lbs. We thought it was probably just because of the lack of water and maybe it was. Hard to tell. Looking back now, however, it seems entirely likely to me that the trees weren't healthy so the fungus on the roots wasn't able to compensate and they just couldn't make truffles as easily. The next year the story was much the same truffle-wise. We didn't have the drought but the disease was absolutely rampant in the orchard. Almost every single tree was affected. We pruned and sprayed and worried -- a lot!! We ended up literally cutting the trees down to about 6-8 inches above ground. We only got about 3 lbs. of truffles that year and just had to believe that the disease had to be a factor. We believe that the drought was the reason the trees got so very badly infected with Eastern Filbert Blight. A drought that severe can weaken the trees and, in their weakened condition, the disease spread like wildfire. That considered opinion resulted from discussions with our agriculture extension agent. Even though he has very little experience with truffle growing and that experience has been provided by us, we put our heads together and just couldn’t make any sense of the severity and suddenness of the spread of the disease any other way. He sent samples of leaves and branches off to the NC Agriculture Dept. for us and they just saw lots of stress as the reason for the seriousness of the disease. We asked him to do this because the trees put out new branches the year after we cut them down so drastically but there was considerable die-back. In other words, the branches would come out and leaf out and then begin to die, with all the leaves eventually turning brown and branches collapsing. As you may have read in earlier posts, we truly agonized over the situation and couldn't quite bring ourselves to do what the expert from Oregon suggested -- pull them out! But, in the end, that's exactly what we did this year. We finally came to the conclusion that you just can't get rid of EFB once it's in a tree. You can keep it from spreading but you can't eradicate it from a tree unless you have pruned at least 18 inches below where the cankers appear and that just wasn't possible for us. We arrived at the decision that it isn't worth continuing to work an orchard where the yield is declining and there is no hope of it increasing again. 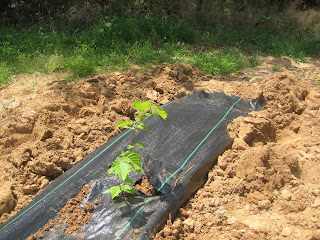 We decided to pull up the trees and replace them with a combination of "blight immune" filberts and 2 varieties of oaks. Filberts should only produce truffles for about 15 years anyway and oaks will produce for a lifetime. Even though a lifetime for us isn't as long as it used to be, maybe there's an opportunity for someone else to enjoy the fruits of our labor in the future. We needed to cut our losses in the original orchard and start over. Fortunately for us, Franklin Garland supplied the replacement trees to us and they appear to be very happy with their new home. We tried to consider every possible option. Could we leave the old trees in the ground and plant between them or should we just get rid of the old ones altogether? Getting rid of them seemed the best route to take. We didn't want to plant new seedlings in a place where there was so much disease and we wanted to completely till the whole field and have a fresh start. With our very limited farming experience, we had to just listen to our guts. Maybe that's what all farmers do until they really get to know their crop and its cycles. And maybe they always to that. For us, after it was done, we were at peace with it. Grow little trees, grow! So, if you have a limited amount of truffle to work with, what does an enterprising truffle farmer do to stay on the minds of truffle customers between truffle seasons? How about a value-added product? Yes, let's do it. Truffle Butter!